The Mother’s Day breakfast-in-bed tradition has certainly done the distance; a well-trodden ritual as reliable as the crumbs left in its wake. But whilst undeniably moving, what’s to say this annual declaration of love couldn’t do with a sprinkling of improvement? A mini makeover? Less messy, more…cheffy? Executive chef Jordan Toft knows a thing or two about cheffing. He also knows a thing or two about dadding, thanks to his 7-year-old daughter, Bally. “Bally and I love cooking at home on Sundays,” he says, “I always give her a little job of her own. It’s a nice way to spend time together and she’s actually getting pretty good – I definitely appreciate her services!” In the spirit of Mother’s Day, we spent a morning in the kitchen with Jordan, creating three boast-worthy breakfast-in-bed dishes. Whether she’s a fitness-lover, a proper foodie, or a dessert-for-breakfast kinda gal, our kid-proof Mother’s Day breakfast recipes are guaranteed to knock mum’s socks off (and place them neatly in the washing basket afterwards). 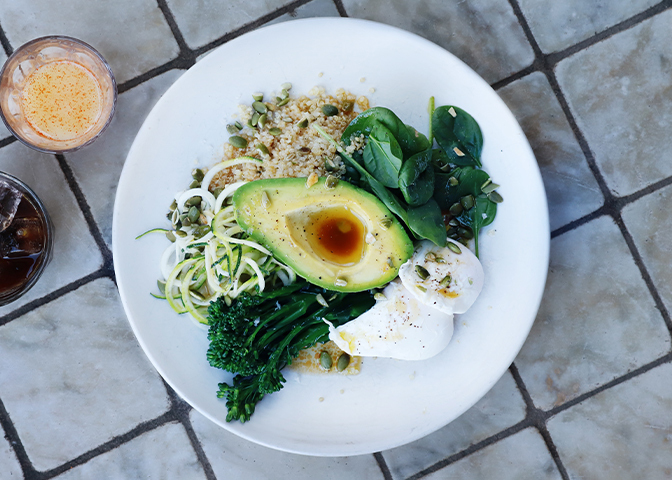 Inspired by the healthy beachside bowls at The Collaroy, this green number packs an antioxidant punch that’ll leave mum feeling supercharged (and oh-so-wholesome). Looking for a different spin on the health thing? We got you. Poach eggs and set aside to keep warm. Whisk tamari, lemon juice and avocado oil to make the dressing. Arrange ingredients, individually, on a wide bowl or plate, dress liberally with tamari, lemon, avocado oil mixture and top with pepitas. To wake mum up with a bang, serve with a 30ml shot of lemon juice (with a sprinkle of cayenne pepper) and a cold drip coffee over ice. 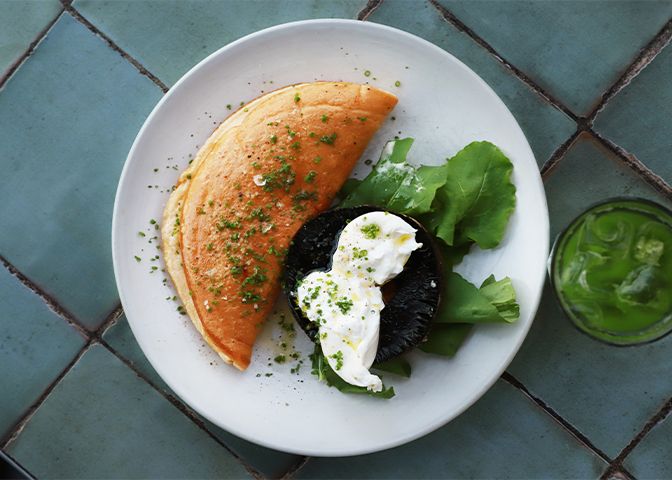 Boring old eggs get a makeover with this scrumptious soufflé–style omelette (which looks way fancier than it actually is). Pre-heat your oven or griller. Lightly oil your mushroom and season, roast until just cooked. Warm a non-stick omelette pan on a moderate heat. Place the warm mushroom on a plate with rocket and burrata torn over the top. Place egg mixture into the pan and cook over medium heat. Allow the ‘soufflé’ to lightly set and brown on the cook side. Using a spatula fold in half, trying to keep as much air as possible in the omelette. Transfer to the plate. Sprinkle chives over the omelette and season with salt and pepper. Serve immediately, with a fresh green juice and ice, for a delicious start to Mum’s special day. Who doesn’t love a dessert-in-disguise, really? This modern-day-masterpiece puts the trusty jaffle-maker to work (with spectacular results). Peel and core apples. Dice into 1cm cubes. Hull and slice strawberries. Melt butter in a small sauce pan (big enough for apples to spread evenly) and place all ingredients, except strawberries, to cook until apples are tender. Add strawberries and remove from the heat. Cool. Whisk egg, milk, cream, sugar and vanilla together. Soak brioche in egg mixture for 5 mins. Heat jaffle maker and spray with oil. Place filling onto one piece of soaked brioche (keeping away from the sides) and place other on top to create sandwich. Cook until golden brown and warmed through. Top with whipped butter, drizzle in maple syrup and dust with extra icing sugar and cinnamon. Serve with Mum’s favourite juice blend over ice. A Mother’s Day treat she won’t forget! Still scared you’ll mess it up? Leave it to the real chefs and take mum out for breakfast instead. Our Mother’s Day pick? The Collaroy. With a winning assortment of brunch options, including a Granola Bowl with chia and coconut yoghurt, and a Mortadella and Burrata Panino (all served with a healthy side of sea air), you’ll have mum stress-free and tickled pink in no time. Spoil her to breakfast and coffee/s at the kiosk, let the kids run free in the play area, and go for a sandy stroll (or brave an autumn swim) afterwards. After all, who doesn’t enjoy a long (caffeinated) walk on the beach? 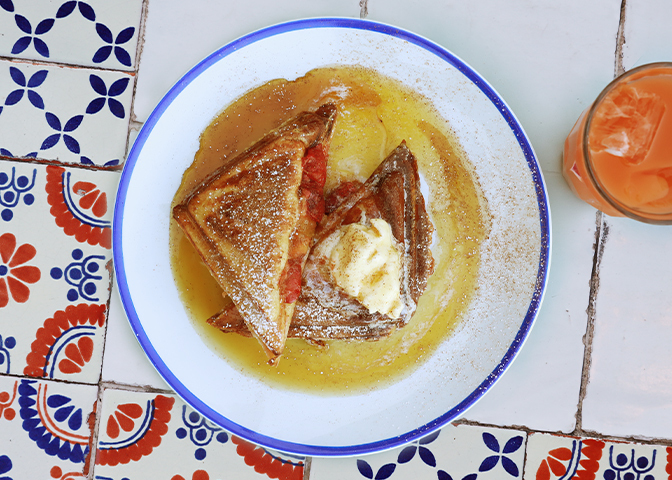 Looking for other kid-friendly brunch spots? Overlooking Pittwater, The Newport is the pub-slash-restaurant-slash-playground that ticks all the boxes, with a kids Gymnasium and a choose-your-own-adventure style menu (bonus: it’s dog friendly). East side? Pop into the Coogee Pavillion, for games, bites and beats (and perhaps a cheeky cocktail) by Coogee beach. More Mother’s Day ideas here. The Collaroy head chef Simon Zalloua gives us the inside track on how their bowls have evolved at the Kiosk – and shares some tips for recreating these nutritious meals at home.